The Pacific island nation Kiribati has found itself at the epicenter of the global climate change debate, as it is one of the first places that will be destroyed if sea levels rise as predicted through this century. Kiribati leaders are currently mulling a major decision to purchase 6,000 acres of land on Fiji’s main island for $9.6 million as insurance against a submerged future. If necessary, they could move their entire permanent population of just over 100,000 onto the land in Fiji. The nation is composed of 32 atolls, like the one shown above, and one coral island spread amidst 1,351,000 square miles of the Pacific Ocean, some of which have already been affected by salinated soil and drinking water due to water level changes. Kiribati President Anote Tong told the Associate Press about the plan, explaining that his cabinet had just endorsed the decision. Tong expressed hope that it would never become necessary to move the entire population of Kiribati, but explained that considering the global circumstances they had to think towards the future. “We would hope not to put everyone on one piece of land, but if it became absolutely necessary, yes, we could do it,” Tong told AP. “It wouldn’t be for me, personally, but would apply more to a younger generation. For them, moving won’t be a matter of choice. It’s basically going to be a matter of survival.” Kiribati is located near the international dateline and has islands on both sides of the equator. Tong said that though ocean levels had only risen slightly so far, the threat of increasing storms and changing tidal patterns had just as much effect on the livelihood of his country’s population. Anote Tong chose the location which can't even support the few locals there. How is it going to handle 100,000 people. Data from the tide station in Tuvalu run by the Australian Government shows that there is NO sea rise! Yes, the islands are sinking naturally. Twice a year there is a king tide, and guess what? The idiots who live on the shoreline (People that came from other islands) get flooded, Duh! Tong also sold off the fish resourches and the locals are eating the parrot fish that help build the islands! While he is sucking up to the UN for a cushy posting. Do your research. Don't always believe the bulls**t from Tong! The Pacific island nation Kiribati has found itself at the epicenter of the global climate change debate, as it is one of the first places that will be destroyed if sea levels rise as predicted through this century. 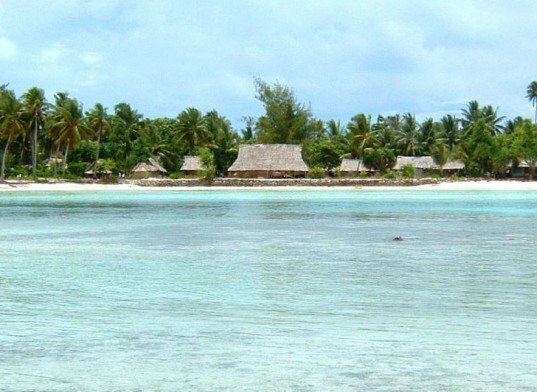 Kiribati leaders are currently mulling a major decision to purchase 6,000 acres of land on Fiji's main island for $9.6 million as insurance against a submerged future. If necessary, they could move their entire permanent population of just over 100,000 onto the land in Fiji. 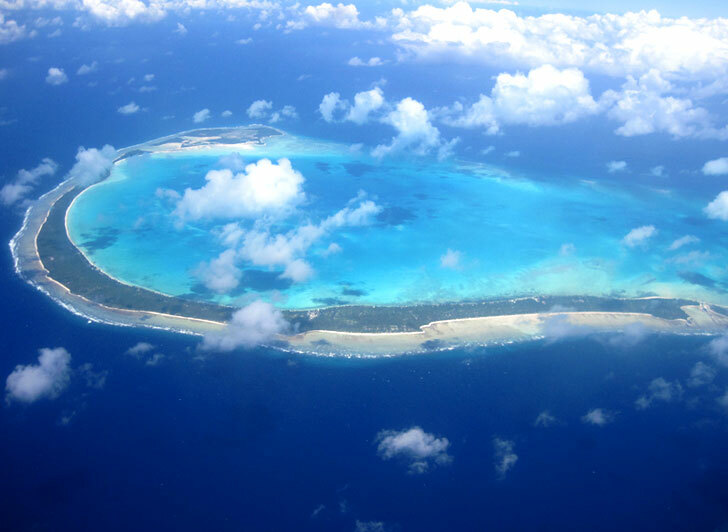 The nation is composed of 32 atolls, like the one shown above, and one coral island spread amidst 1,351,000 square miles of the Pacific Ocean, some of which have already been affected by salinated soil and drinking water due to water level changes.